The University of Michigan is a public university, founded 200 years ago with the sole purpose of serving the public good. Last week, we were proud to announce an initiative that enhances our public mission by guaranteeing free tuition to in-state students with the greatest financial need. About half of the families in Michigan may be eligible for what we are calling the Go Blue Guarantee. While this is a new financial aid program for our Ann Arbor campus, the motivation and commitment behind it represent longstanding university values. For years, we have sought the most talented students from all communities in Michigan and we have provided generous financial aid to all students according to their financial need. This includes those from middle-class families as well as some from families with incomes as high as $180,000 a year. These commitments to broad statewide access to a U-M education and generous need-based financial aid will not change. Our admissions process does not take into account a student’s ability to pay, and we will continue to meet the full financial need of all in-state students. What the Go Blue Guarantee does is offer an important promise to the people of our state. It transforms our historic commitment to helping qualified students from Michigan afford a U-M education into a guarantee. The guarantee is this: All in-state undergraduate students from families with an annual income of up to $65,000 will receive up to four years of free tuition if admitted to our Ann Arbor campus, subject to certain limits. About half the families in the state of Michigan make $65,000 or less, and the Go Blue Guarantee covers the full cost of tuition for students from these families if they’re eligible – and they may also receive additional financial aid for books, room and board, and other costs based on their individual circumstances. I have heard from far too many students and families throughout our state who don’t pursue a U-M education because they fear they can’t afford it. This is heartbreaking. We want all qualified students to know that if they work hard, apply and get admitted, the University of Michigan will be there for them, regardless of their family’s financial situation. Imagine having a child who works hard, gets good grades and demonstrates leadership in the community – and yet who won’t even try to get into Michigan because they don’t think they can afford it. Money should not stand in the way of students’ dreams of bettering their lives through education and earning a college degree. Since announcing the Go Blue Guarantee, some people have asked how the university is able to afford such a generous program. The Go Blue Guarantee is the result of more than a decade of double-digit growth in our financial aid budget, careful financial management of the university, and the generosity of our donors. Over the last 10 years, we have increased our undergraduate financial aid budget by an average of 11.3 percent per year, compared with 4 percent per year for in-state undergraduate tuition. Today’s students with financial need are paying less to attend U-M than students of a decade ago – and for graduates who leave U-M with debt, the average balances are lower and declining. Our current Victors for Michigan fundraising campaign has raised nearly $1 billion for student support, and 21 percent of our endowment is dedicated to financial aid. This means our generous donors share our belief in educational opportunity for all students. Our commitment to serve all people in Michigan extends to middle-class families seeking to send students to U-M, as well. Many in-state students from families earning up to $125,000 a year are awarded scholarships and grants that pay half their tuition. The amount of these financial aid awards depend on many factors, including how many kids you have in college, assets, etc. I can’t say this enough: Financial aid is complex, and there are many misconceptions out there, so please apply for aid if you think you may need help paying for college. U-M has staff trained to help Michigan families navigate the process. In light of the value U-M provides, we were recognized as the top public university in Money Magazine’s 2016 list of “Best Colleges for your Money.” The rankings were determined by factors that include graduation rates, affordability, loan amounts for students and families and future earnings potential of our graduates. The Go Blue Guarantee cuts through the complexities of financial aid to help us reach talented students from all communities across our state. I have always believed that talent is ubiquitous in our society, but opportunity most certainly is not. The Go Blue Guarantee helps us ensure more opportunity for those with the most financial need, while preserving affordability for all Michigan residents. The University of Michigan’s commitment to provide access to an outstanding and affordable college education to the people of our great state is the highest expression of our mission to serve the public good. I am honored to express this commitment to all Michigan residents, written proudly, in maize and blue. I remember when I was growing up my Grandfather always telling us that nothing in life is ever truly free. He would always end this life lesson by saying, "Someone will always and invariably be paying for it." To his credit, President Schlissel didn't say that this would be totally free either when he hinted at the other costs of a college education that will blow a hole in any family's budget; room & board, books & supplies. There was no mention of the recently announced increase in room & board rates to $11,198/year. There was no mention of books which college professors always love to change seemly multiple times in a calendar per year and in some cases never used at all during a course. There was also no mention of the 2.9 % tuition increase for undergrads who do not fall under this program nor the 4.5% for nonresident tuition. To be fair, it's a nice start if a means can be found internally to pay for it. But as my Grandfather said, nothing is ever truly free. That point needs to be emphasized here. I'm proud of my alma mater for taking this bold step to expand access. My wife, children and I benefited immeasurably from our U-M degrees, and it is wonderful that Michigan is now the leader in making an exceptional education affordable. I would expect a flood of additional applications and more intense competition for admission. Unless U-M plans to grow, some students who were accepted previously will face rejection. I hope administrators will be thoughtful about the appropriate level of out-of state students. I am confident they will. Go Blue! It would be interesting to see how this affects graduation rates. I wonder if President Schlissel is willing to see how the lack of tuition impacts the graduation rates of those receiving scholarship for their parents financial status relative to other students. I wonder how those students [paying for their tuition] who have a more demanding work and academic load being forced to be more disciplined and committed compared to the others. Does work impact academic success? It would be interesting to include post graduation surveys, how having worked impacted their hiring and being of work. Could be a great program, but attention to students' needs, especially non-cognitive ones should be enhanced. Many students from poor families and communities, especially rural ones, will need help navigating the vast dimensions of U of M and academia. 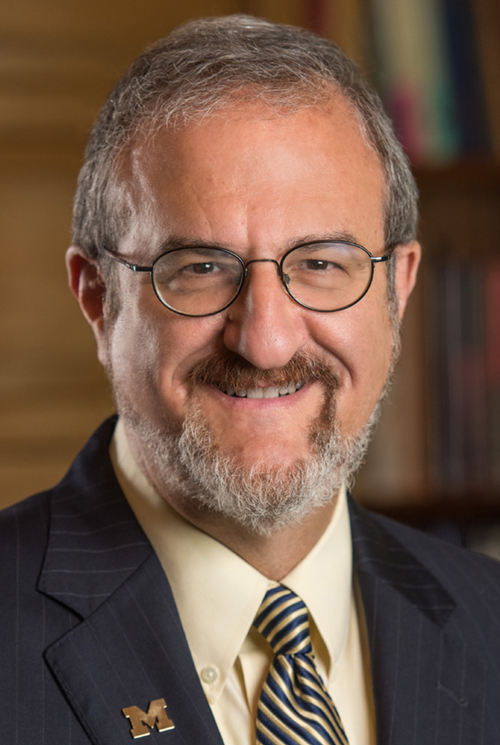 Dr. Schlissel is correct: "Money should not stand in the way of students’ dreams of bettering their lives through education and earning a college degree." I hope many students will take advantage and finish their degrees. I disagree, money should be one of those barriers to be overcome when earning an education, much like learning to study, disciplining oneself to study, learning to listen, learning to work with others, etc. The value of a degree isn't just what is learned in the classroom, it is learning to manage oneself, learning the value of all the aspects of the degree, it is learning the responsibilities of being educated. The way frame this tuition 'scholarship' that it is earn by the student's parent not by the student. it is because of who the students parents are not what the student has done. Consider the academic scholarships, they are earned based on the efforts and successes of the student and even the sacrifices of their parents, athletic scholarships are earned by the efforts and successes of the students and the sacrifices of the parents, even those who have to work to pay for their tuition it was based on their efforts. Money is a common measure of a base cost/value for all the services and products in our society. What better time to learn that base value of an education when you are earning that degree. I feel that not having to pay at least part of the cost of one's education deprives the student of a key learning experience in their education. I think those funds President Schlissel is committing would provide more value to the students if it were to create an 'internship' program where the target students would earn their tuition by being involved in applying the degree subjects in a work setting. Much like what I have seen employers with internship or coop programs for engineering students. It is a way for the student have responsibility for their education, a way to learn and everyday side of that education, a way for them to develop their resume, a way to begin looking past the degree and seeing whether they want more education, they want to stay in the field, where their interest lies in the field, etc. Simply giving money [tuition] based on who a students parents are risks detaching them from the value of the 'gift' and the learning experiences that are important for the students. I am a proud graduate of The University of Michigan. I think it is a great thing to offer those who may have financial roadblocks to overcome being able to send their children to college. My only reservation - as I have been saying forever - is the students need to be prepared! They need to have at least an idea of how to swim before they jump into the pool! I attended the University of Detroit Mercy long after I graduated from U of M. One thing that impressed me is there were tutors and smaller classes and a more personal approach. True, U of DM is not as big as U of M but the degree one can earn from there is! Fortunately for me, I had always attended school with white youth and was ready for ANY type of behavior that would have - and still could - impede the success of a less than fortunate white or non-white student. Because of my parent's worldliness and hard won achievements, I was realistic and able to resist roadblocks in order to realize my dream of reaching for that diploma and reeling it in! One day I will write about some of the wrongs I wrestled with from one white teacher and his class as well as with other random acts and issues. But I survived and all of that negative treatment DID NOT drive me away. Did NOT cause me to feel unworthy. DID NOT dampen my spirit. Instead it DROVE me to fulfill my desire to get MY degree! I say DARE to DREAD and DO IT!!! But I survived and all of that negative treatment DID NOT drive me away. Did NOT cause me to feel unworthy. DID NOT dampen my spirit. Instead it DROVE me to fulfill my desire to get MY degree! I say DARE to DREAM and DO IT!!! I’d just like U of M to stop turning down qualified Michigan students in favor of out-state and foreign students.